Oh, big tragedy! We ran out of stickers yesterday, oh no!! Muffin and I did a quick run to the local Target last night to get some stickers. (BTW Its amazing how quiet the stores were just b/c it was Superbowl Sunday.) But on the way out we happened to walk by the little Target Cafe (which was closed) and all the way home Muffin kept saying in her actress voice "Oh, owe is me!" just because she wanted a big soft pretzel and couldn't get it. Where do they get stuff like that? Had me cracking up all the way home. Turns out that when she turns on the suffering actress mode on DH, he responds by saying 'woe is me'. Hmph, and he blames ME for all her acting ability! Methinks she's learning some from her daddy! 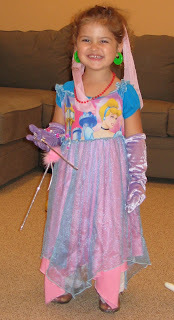 Just for the fun of it, here's a picture of our aspiring actress in full costume. Enjoy!